One has to wonder why Seagate has launched a new version of the Backup Plus. It uses the same three-year-old drive as its predecessor, and doesn’t bring much to the table, especially as it carries a much higher price tag – although you do get bundled software in the form of Mylio Create and Adobe CC. Meet the Backup Plus Slim from Seagate, yet another portable hard disk drive that uses the tried and trusted ST2000LM007, a hard drive that was unleashed in the first quarter of 2016. The Backup Plus Slim (STHN1000402) is available in 1TB and 2TB models, in a light blue, black or brushed aluminum finish. Amazon lists these drives for $60 and $80 respectively. Seagate also sells a version of the Backup Plus Slim called the Ultra Touch. 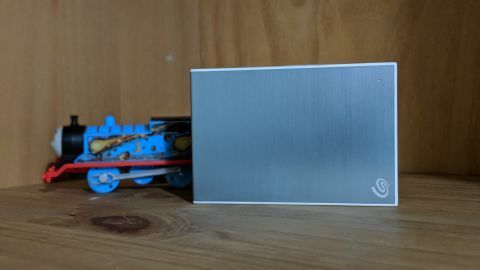 The main differences between the two products are a higher price point for the Ultra Touch – $90 at Amazon for the 2TB model, $70 for the 1TB – and a different design that involves a piece of fabric in lieu of the brushed metal finish. There’s nothing particularly noteworthy about the Backup Plus Slim – its design is utilitarian and certainly isn’t trying to win any awards. Seagate opted for a plastic chassis with a thin brushed metal cover on top. Other than the Seagate logo and a white status light, there’s hardly anything that catches the eye here. As for its size, the Backup Plus Slim is absolutely tiny at 115 x 78 x 12mm with a weight of only 126g, meaning you can truly carry it around in your pocket. There doesn’t seem to be any easy way to pry open the case should you want to extract the hard disk drive. It comes with a 46cm USB 3.0 cable with an additional cap that converts one end to a USB Type-C connector. This product uses the old ST2000LM007 drive, as we mentioned, a disk which has two 1TB platters spinning at 5,400 RPM with 128MB cache. Surprisingly, though, that drive costs more on its own than when packaged as the Backup Plus Slim. Unbelievable, yet true. It is a slightly-better-than-average performer as shown in our CrystalDiskMark and Atto benchmarks. The Backup Plus Slim scored between 141 and 144MBps on reads and around 137MBps on write speeds, while a 10GB file was transferred at 128MBps. It was cool to the touch during use, and barely audible. The drive comes with the brand new Mylio photo management software and a two-month subscription to Adobe Creative Cloud, but no storage applications like, say, the WD My Passport Ultra range. That’s great if you have any inclination towards the creative side of computing, but not so great if you only want quality storage on the cheap (the drive comes with a two-year warranty, by the way). While Seagate doesn’t have any competition for its 5TB portable hard drive, things are radically different for lower capacity products, not least from Seagate’s older models. The older Backup Plus Slim, for example, costs $45 and $60 for the 1TB and 2TB models respectively. The Expansion range, another Seagate line, is equally competitive at $40 and $65 for the same capacities respectively (note: all quoted prices are from Amazon.com, and correct at the time of writing). Western Digital and Toshiba prices are slightly more expensive. A special mention must be given to Silicon Power, which offers a 4TB external hard disk drive that’s shockproof and waterproof at $110 – as cheap as the new Backup Plus Slim. Should Seagate have swapped the LM0007 for the LMZ15, a newer, potentially faster hard drive? Maybe – but then there’s very little incentive to do so. As it stands, the big players do not seem to have any intention of investing R&D in smaller platters to go in the drives equipped by the Backup Plus Slim. That explains why the platter capacity has stagnated at 1TB since, well, September 2015. Seagate itself said back in 2012 that 60TB hard drives may come to the market by 2020, but instead fired up a 60TB SSD (which uses flash memory) in 2016. Speaking of which, it might not be long before we wave goodbye to hard drives anyway. A recent glut of inventory means that SSD prices have fallen significantly, dangerously approaching the symbolic floor of $100 per TB, about twice what a hard disk of similar capacity costs today. If that trend continues, a 1TB external SSD will cost less than a 1TB hard drive this time next year. Let’s return to the Backup Plus Slim, though: should you buy it? The simple answer is probably not, there are cheaper hard disk drives out there from Seagate itself. Don’t waste your money on this model, just opt for last year’s Backup Plus or the Expansion range, unless you absolutely love Mylio Create and want to try Adobe Creative Cloud.